When I saw this book, my interest was immediately piqued, as my young nephew has been diagnosed with autism. As a mom, I could not help but be pulled in by Cathleen's determination to do her very best for her special needs son. I could understand her struggle in those first few months of hearing bad diagnosis after bad diagnosis: blindness, autism, will never walk, etc. I mourned with her the loss of her "normal" child. Lest you think this book is all doom and gloom, think again! Although Rex was born blind and diagnosed with other issues, you can't help but be inspired by him, his mother, and his teachers. Receiving a small keyboard from his father on his second birthday, Rex begins to make strides that no one thought he would. Unbelievably, although Rex couldn't even walk around his own living room without becoming disoriented, he could play complicated pieces of music... without the music. 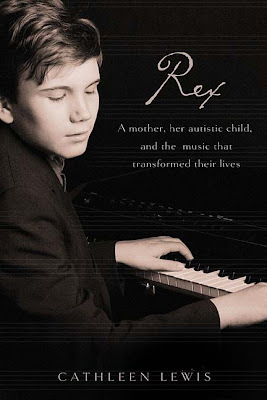 His piano teachers could play a series of notes or even whole selections of music - something Rex had never heard before - and, Rex could play it back note by note. You can't help but admire Cathleen and her tireless journey of advocating for her son. Only those with a special needs child could truly understand and appreciate the commitment it takes. Rex represents many special young people. True, many children with disabilities may not be able to play the piano like a master – but, I’m afraid we have underestimated their ABILITIES! After reading this book, you can’t help but look at those children that “professionals” have diagnosed as disabled and try to see beyond what the doctors see. Seeing instead, the amazing abilities and talents they DO have and trying to nurture them. 256 pages by Thomas Nelson Publishers.